In order to have peace and joy, you must succeed in having peace within each of your steps. Your steps are the most important thing. It might sound funny, but the very first time I practiced walking meditation was when I was walking my oldest son to sleep one night in a baby carrier. For quite a while before then I had sat in meditation, practicing zazen (the Japanese word for sitting meditation in Zen). But it was really after beginning to read Thich Nhat Hanh that I was introduced to the idea of bringing my practice into my everyday life. The first time I was introduced to walking meditation, I didn't make any immediate effort to practice it and just thought it would be a nice thing to add to my practice at some point. Well, one night that opportunity presented itself most clearly. As I was walking my son around one night, back and forth across the room to put him to sleep, it hit me: my mind was off in la-la-land. I then remembered what I had read about walking meditation, and decided to give it a try. That's when I discovered how amazing walking meditation, and really mindfulness practice throughout everyday life, was. I can't really describe what it feels like to walk mindfully. To walk intentionally, closely and carefully aware of each step that you take. Each step that you take you're fully present in that moment with all of your being. It instills in you a quiet sense of peace that I find very hard to describe. The words that most come to mind are: peaceful, harmonious, and connected. This is a guide intended to help you discover that same sense of peace I feel when I practice walking meditation in my own life. So, what exactly is walking meditation? Is it just walking around mindfully? For the most part yes, it's really mindful walking, but depending on how you practice it there's more to it than just that. And there's definitely more to it than simply the practice in itself. Walking meditation is something which has perhaps been practiced for thousands of years in some form. Indeed, moving meditation of various kinds has always been popular (which includes walking meditation, other mindfulness practices, Yoga, Tai Chi, and others) and walking meditation is one of the most popular. During the Golden Age of Zen in China, practitioners would travel all across China searching for a teacher who was a perfect fit for their style of learning and who could transmit the highest awakening to them (meaning essentially that they could communicate clearly to them in a way that resonated with them, a sort of chemistry). Because of all the traveling they did, walking meditation was the most common form of meditation at that time in China. Indeed, as long as you're walking, you might as well walk mindfully. On the surface, there really isn't anything more to walking meditation than to walk mindfully. But just as with sitting in meditation, it's deceptively deep and profound. To understand that more clearly, let's go over why walking meditation is so significant. Walking is one of the single most common activities in everyday human life. Across all countries, cultures, and lifestyles, walking is a major part of daily life. We walk from our bed in the morning to the restroom, from our room to our kitchen, to our kitchen back to our room, from our home to our car/bus/bike, from our mode of transportation to work, from work back to our mode of transportation, from there to whatever stores or locations we visit along the way, back from our car/bike/bus to our home, and within our home constantly (all depending on your own specific daily schedule of course). There are few things we do more often than walk, and so walking meditation is one of the single most powerful and nourishing practices you could ever adopt. But there's more to it than that. Walking meditation can work as a highly effective "bridge" for bringing mindfulness into your daily life. After long sessions of zazen (sitting meditation), Zen practitioners will get up and practice sessions of kinhin (walking meditation in Japanese). Why do they do this? The intention is to bring that state they've cultivated during their sitting meditation practice into motion, into their everyday actions. And walking provides the best gateway for doing just that. Using walking meditation as a bridge for making meditation a way of life, instead of just sitting for a few minutes a day, is invaluable. And for that reason, walking meditation is probably the most important thing you can begin doing if your intention is to take your meditation practice to the next level. But even if you've never practiced meditation, walking meditation can be an incredible introductory practice. Mindfulness practice of all kinds, especially walking meditation, is highly nourishing and allows you to find a moment of peace and a sense of being grounded or "balanced" each day that's invaluable for our well-being. I would still suggest beginning with sitting meditation, but if you're naturally very active and tend to find it difficult to sit still for even short periods of time, walking meditation may be the perfect practice to begin with (or preferably to mix in with your sitting practice). Walking meditation is simply mindful walking, but depending on whether you're a beginner to mindfulness or you've practiced for a bit, and depending on the situation, the actual practice can vary. Detailed below are really the 3 major walking meditation techniques along with instruction. Keep in mind, there isn't much of a hard rule about how you're supposed to practice walking meditation, but the first 2 practices listed have been practiced for a very long time, and so I'd suggest following the walking meditation instructions below at least for a time, until you really get the idea. The first walking meditation technique is counting your steps, and it's the most common. Counting your steps, like counting your breath, is the easiest walking meditation technique and so the form I'd suggest starting with. Like counting your breath, counting your steps is all about counting each step as 1 (left 1, right 2, left 3) until you get to 10. Unlike following your breath though, there's an extra step to walking meditation: matching your steps to your breath. 1. Begin walking at a naturally slow pace. Walk slowly, but naturally. 2. Posture & positioning. Walk with good posture and bring your hands up to around your diaphragm. Place your left hand up against your diaphragm and your right hand directly in front of it, then allow your thumbs to cross so that your left thumb is in front and your right thumb is against your body. Your forearms should be horizontal with the ground. This hand positioning helps balance and stabilize you while walking. 3. Match your steps to your breath. Breathe naturally and pay attention to how many naturally slow steps you take for each in-breath and each out-breath. The in-breath tends to be shorter, so keep that in mind (in-breath may be 3 steps, while out-breath is 4). 4. Count your steps. Now that you know how many steps you're taking for each in-breath and out-breath, count them. 1-2-3, 1-2-3-4, 1-2-3, 1-2-3-4. Left-right-left, right-left-right-left, right-left-right, left-right-left-right. In-breath, out-breath, in-breath, out-breath. 5. Be mindful. Be fully present as you count each left step and each right step. You're being mindful of the count here most of all, that's what you're focusing on. You can be mindful of the movement of your legs in between counts as well. 6. Acknowledge that which arises. Throughout your walking meditation you'll be concentrated(*) on your steps, but because this is mindfulness practice your awareness should be open and welcoming. What this means is that as thoughts, feelings, sensations, and even sometimes outside distractions come into focus, gently acknowledge them nonjudgmentally (which is code for: don't intentionally think anything about them. You're just noticing them. Not judging them) so that you can observe them clearly, and then shift your focus back to your breath. If you're new to meditation, you may find yourself interrupted constantly. This is perfectly fine and will wear off in large part over time. No matter how often a thought, feeling, or sensation arises acknowledge it mindfully and then shift your focus back to your breath. *A note on concentration: By concentration, I don't mean a head-splitting, vein-popping concentration. I'm referring to a light concentration which still allows your open mindful awareness to take in everything that arises. Following your steps is the natural progression of counting your steps and is a slightly more difficult walking meditation technique. If you find it difficult to go directly from there to here, you can always try counting your left (or right) and following your right (or left). In this way, you're doing a practice which is in the middle of the two, which can sometimes be easier if you're finding it hard to transition to this version. Like sitting in meditation and counting your breath, after you get to a point where you've gotten used to counting your steps and can do it relatively effectively, I'd begin simply walking and following the full length of each individual step. It's at this point that it's important to really break down the act of walking, because in mindfulness practice it's important to know exactly what you're doing in each moment so that you can be fully present for that moment. When walking, are you just moving your legs forward, one step at a time? Not quite! Walking is a gross movement, meaning there's multiple movements included within the greater action of walking. And this is really what you should be paying attention to as you follow the length of each complete left step and each complete right step. 3. Match your steps to your breath. Breathe naturally and pay attention to how many naturally slow steps you take for each in-breath and each out-breath. The in-breath tends to be short, so keep that in mind (in-breath may be 3 steps, while out-breath is 4). Why do we match our steps to our breath, even though we're following our steps in this version? Because bringing our steps in line with the rhythm or our breath creates a sense of unity with our mind and body, and this is a very important principle in meditation. 4. Follow your steps. This is really the essence of this version of walking meditation. Follow the movement of your left foot from the time you begin lifting the foot, as you transition to swinging it forward, and then as you place it back down. Then the same with the right foot back-and-forth. It's 3 movements, but you'll quickly realize that the act of following your steps is very fluid and that there is no separation between the movements. 5. Be mindful. Be fully present as you count each in-breath and each out-breath. 6. Acknowledge that which arises. Throughout your walking meditation you'll be concentrated on your steps, but because this is mindfulness practice your awareness should be open and welcoming. This is both a simple practice and at the same time the most advanced walking meditation technique. Sure, nothing is technically required for you to get up and begin walking down the street mindfully. 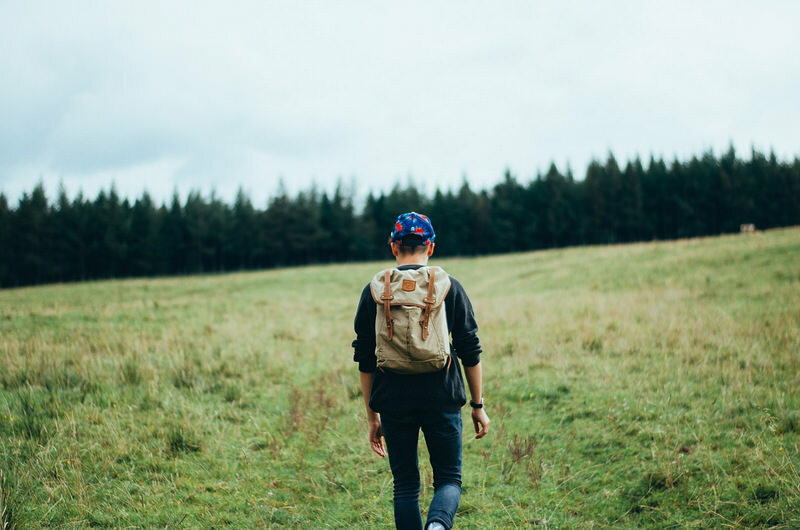 But, without some practice with one or both of the first two forms of walking meditation, walking effectively in a typical everyday situation can seem altogether impossible. First, there's the fact that when you begin your walking meditation practice you generally walk rather slowly so that you can maintain mindfulness (something which won't be a problem with practice, but at first a slow pace is required). This obviously isn't the pace you ever walk in your everyday life. Then, there's the fact that there's a million other things vying for your attention as you walk: passing cars, street signs, advertisements, store windows, and other people. 1. Continue to practice. Just make the effort to be mindful while walking at a normal pace in your everyday life. This won't be all you need to help you get the hang of it, but it will help. 2. Allow some of those other objects to come into your awareness from time to time, acknowledge them, and gently shift your awareness back to your steps. Even if this happens repeatedly at first, this will still help overtime to improve your practice. And besides, as long as you're being mindful of what's going on in the present moment, you're practicing mindfulness to some degree (even if it's not of your steps). 3. Have a dedicated walking meditation practice. A dedicated walking meditation practice is different from walking in everyday life. I suggest both striving to walk mindfully throughout your daily life as well as having a dedicated time for walking meditation (preferably right after your sitting meditation practice). In this way, you help support your effort to walk mindfully throughout your daily life. As far as actual instruction, this is simply the act of walking in the way you walk every single day of your life and at your normal pace, so nothing needs to actually be done except to be mindful of each complete left step and right step. Although that's easier said than done as noted above. Just use the instructions for 'following the length of your steps' and walk at your normal everyday pace (you may not have your hands up in the kinhin position too, and that's fine). If at first it seems too difficult to do, just practice for a few minutes at a time and then let go of it. With time it will become easier and your practice will be more fluid. Aside from the traditional walking meditation instructions, there are other highly beneficial practices you can do. I'd urge you to get creative and realize that any and every opportunity to walk is an opportunity to practice walking meditation. Some opportunities might make for deeper and more nourishing versions of the practice, but there's many ways to practice and some of those ways have added benefits which I haven't yet listed. Walking in nature can be done simply as-is, meaning as walking meditation is usually practiced, or you can integrate it with your surroundings to create an even more nourishing and balancing meditation. 1. Discover the path. To practice the walk of life walking meditation, find a nice quiet place to walk, preferably in nature. If you know of a local park, hiking trail, or somewhere else close to nature you can walk that would be ideal. 2. Connect with the Earth. It's also preferable that you take your shoes off and walk barefoot so that you can feel the Earth beneath your feet. Both above mentioned points will enhance the meditation but are not required. 3. Walk the path. Simply begin breathing mindfully. Once you've taken a few breaths, begin walking. Walk relatively slowly. 4. Walk mindfully. Continue to walk and breathe naturally, don't force a certain pace. Your focus during this meditation is the raising, swinging, and placing down of each individual foot. Be mindful as your left foot raises, swings, and lowers. Then, once your left foot has been placed down on the ground, be mindful of your right foot being lifted, swung, and lowered as well. 5. Breathe the walking. Walk the breathing. Try to match your steps with your breath to create a sense of unity within your entire being. If you can do 2 slow steps for each in breath and another 2-3 steps for each out breath, then say to yourself silently, "step, step" on each in breath, and, "step, step" to yourself on each out breath (or just count 1, 2, 3). 6. Become the tree. Take a moment from time to time to stop and imagine your feet extending down into the Earth, like the roots of a great and immovable tree (you could continue walking and do this as well, but that sense of stability is easier to get while standing with both feet on the ground). Continue to imagine yourself expanding out indefinitely, your legs as roots, your arms as branches, and many leaves blooming all around you. Focus on your abdomen for a moment, keep your feet planted firmly on the ground, and feel your sense of stability and groundedness. Walking with others mindfully can be a great joy, although it can be difficult to do at first and therefore is relegated to a rather advanced walking meditation practice. Walking with others has huge benefits: we're walking mindfully, spending time with others, getting outside (usually), and getting a little exercise while we're at it. It's really a quadruple whammy for our well-being. While walking with others, I'd suggest keeping it as simple as possible and simply following the length of your steps. 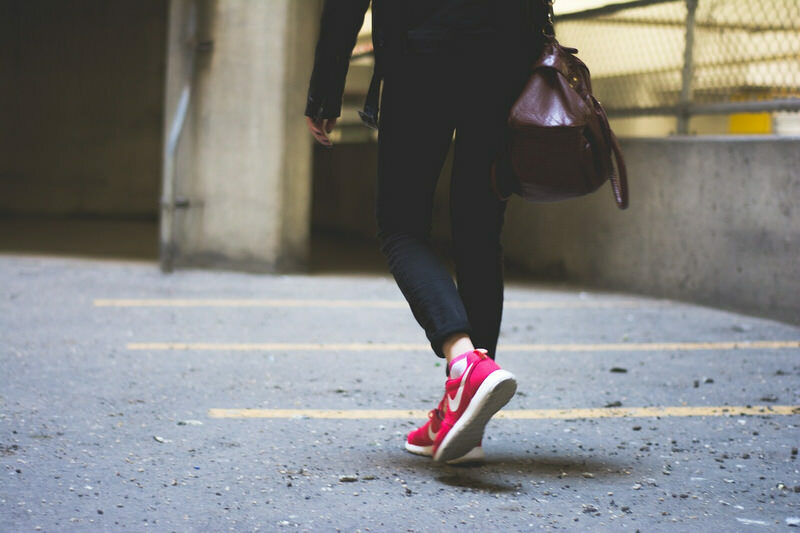 Get a little practice in counting your steps in first, then once you're accustomed to this move on to following your steps. Then, if you've done this for a week or two every few days (or every day, better yet), you should be ready to try this. While in conversation, be mindful of the words the other person is speaking. When speaking, be aware of the words you're speaking. Don't think you have to continue to focus on your steps during that time. There is a way to walk more mindfully while still hearing the other person's words though, which you'll realize with a little practice. So, where should you walk? If it's a dedicated walk with a friend or loved one, I'd suggest a natural setting outdoors such as a park or hiking trail (suggested in the Walk of Life meditation). Being in a natural setting such as that has many added benefits for our well-being. Simply feeling more connected to the Earth has a powerfully nourishing effect. So take a moment and try mindful walking with others. You could even get them in on the practice of walking meditation as well and have a silent walk. 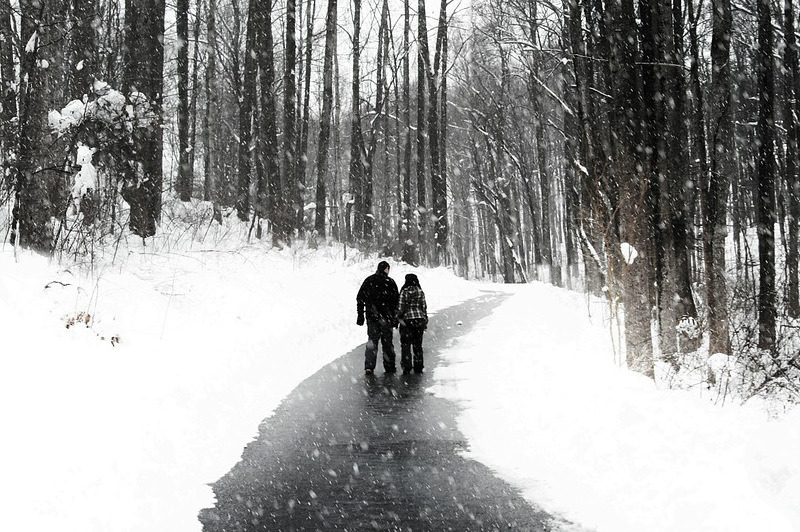 Walking together mindfully, silently, is a truly beautiful experience (even if for only a few moments). There are a few things I wish I had known when I began my personal walking meditation practice (which few people seem to be very clear about), and it's here that I seek to clear those questions up for anyone else looking to adopt a regular walking meditation practice. You might notice some overlap between these questions and some of the information in the guide, that's intentional. I wanted to make sure I mentioned them repeatedly to get the point across, because they tend to be pretty important points. It can be very nourishing to do things in mindfulness slowly. When first beginning a mindfulness practice, it's better to start slow to get the practice down. 1. At first, walk slowly. About 1 step every 3-5 seconds. 2. After a while, you can practice your dedicated walking meditation practice a little more quickly. About 1 step every 2-3 seconds. I prefer a bit of a slower pace for my dedicated walking meditation practice, but you can choose to walk at a completely normal everyday pace. Many Zen monasteries do so, depending on the school and monastery itself. 3. When walking in everyday life, after doing your dedicated practice for some time, walk at your normal pace. Don't purposely slow yourself down. At first, you may feel the need as you're getting the hang of things. This is OK, but quickly work to be able to walk at a normal pace mindfully. Q: I find it really difficult to match my steps to my breath. It feels unnatural. Am I doing something wrong? A: This is something I really wish I had an answer to at the beginning of my personal practice. Both walk at a natural pace and breathe at a natural pace. Don't force either. Try to notice how many natural steps you take for each natural in-breath and out-breath. This is the number you should be counting if you're counting your steps. Oftentimes, your in-breath will be shorter than your out-breath. This is natural and perfectly fine, but the point is you won't be counting 3 then 3. You'll be counting, say, 3 (3 steps on in-breath) then 4 (4 steps on out-breath) for example. Sometimes, it can be best to just let both go for a while until you feel you're doing both naturally, and then after a minute to come back and simply focus on one, like your steps, and to focus on bringing them in sync. Q: How long should I practice walking meditation? A: Like sitting meditation, there's no specific amount of time that you should practice walking meditation. If you find yourself with 5 extra minutes in your day, practice walking meditation. If you have 1 minute, practice walking meditation. For your regularly scheduled practice of walking meditation, I'd suggest starting out with about 10 minutes. If you feel any sort of mental resistance to this, you can lower that amount down to 5 or fewer minutes while you develop it into a habit. I'd suggest doing your dedicated walking meditation practice right after your sitting meditation practice, to begin bringing the essence of that single-pointed awareness, mindfulness, that you're cultivating if you're sitting in meditation regularly. Q: What do I do when I'm taking a walk with someone else? Practicing walking meditation? Or be present for them? - Sometimes you're posed with difficult situations in your mindfulness practice where you're seemingly being asked to choose what to be mindful of. During these moments you have to use your best judgment and primarily be mindful of the most important thing in that moment. If you're walking with a friend of loved one, it's most important to be present for your conversation with them. - You should though begin practicing with the expanded levels of awareness, which essentially means broadening your awareness to encompass more objects of focus during your meditation and sort of "shifting" or bouncing between the two as each moment is different. While your friend may be talking one moment, there may be a moment of silence the next, and knowing when and what to be mindful of is key to an effective practice. The expanded levels of awareness are a bit beyond the scope of this guide, but if you'd like to learn about them in detail I'd suggest either my book Zen for Everyday Life, or my online course Journey to the Present Moment. Learn how to live with the energy of mindfulness throughout your everyday life with this moment-to-moment practice guide. You can get the first 2 chapters free by clicking here. Discover the power of mindfulness meditation in simple, straight-forward, and crystal clear language. You can get a free download of The Little Book of Mindfulness exclusively on Buddhaimonia by clicking here. I hope you've enjoyed this guide to the beautiful practice of walking meditation. It's time to get out there and begin your own practice of walking meditation. However you decide to do that, if you let this beautiful practice into your life, it's sure to have a powerful effect.